Georgia-bred Zach Williams first began writing his bewildered and often heartbroken lyrics after his wife took a terrible fall from a horse, seeking strands of hope and healing as he sat in an Atlanta hospital during an emotionally wrought time. After he and his wife moved to New York, an early band incarnation as Zach Williams and the Bellow was eventually streamlined as The Lone Bellow. Word-of-mouth spread on this surprising Park Slope group and their vivacious take on Americana, flush with lamentations which seethed with beautiful, brutal honesty but were robust and catchy. They got early local support from WFUV and built a national profile via NPR Music. By the time The Lone Bellow's self-titled debut album (which was recorded at Rockwood Music Hall in a mere three days with producer Charlie Peacock) was released in January 2013, they were already the subject of a New York Times profile. 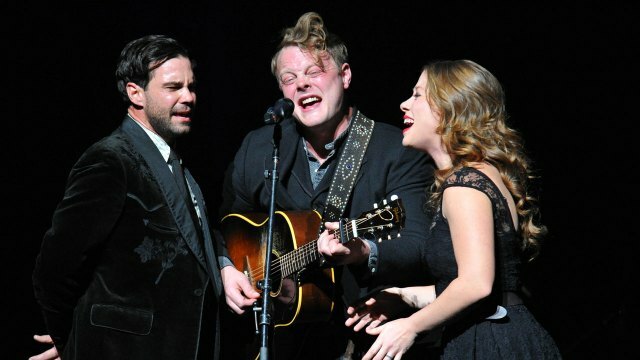 Ahead, The Lone Bellow have a sophomore album in the works for 2015, Then Came The Morning, produced by Aaron Dessner of The National.